Have you ever needed to deactivate a trigger for some maintenance activities on records or for a code deployment? At a high level, the act of activating/deactivating a trigger is simple. 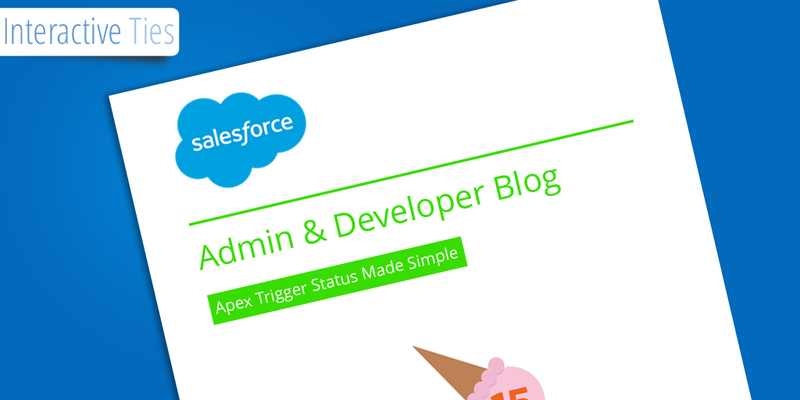 Go to your Salesforce sandbox, modify the status of the trigger and deploy the code. Depending on your unit test coverage for the trigger you may have to tweak the test class and include that in the deployment. If you're working in a Salesforce organization that has lots of code then the deployment may take some time. 20 minutes. 40 minutes. Maybe more. What if you could simply check/uncheck a box in order to turn on/off a trigger? The solution I am going to illustrate here allows for very simple and quick manipulation of trigger status via Custom Setting. At a high level, the trigger will look for its own status record in a Custom Setting object and based upon that designation the trigger will either process its logic or it won't. Description: The triggers for the org and the active/inactive status for them. Help Text: Checked means the trigger is active and will fire. The handler will be where we grab the trigger status from the Custom Setting. As you can see we grab the trigger status from the Custom Setting when the trigger handler is constructed. Since the information is stored in a Custom Setting we can easily and efficiently access it using the isOkayToRun getter method. Make sure you use the same Name from your Custom Setting on line 22 within the trigger handler. Otherwise, the handler will not find a matching record in the Custom Setting object. The time savings for this type of trigger configuration can be huge and in situations where time is of the essence you may be well served by having something like this setup in your org.